Kaspersky™ Anti-Virus (KAV) provides all types of anti-virus protection: anti-virus scan-ners, monitors, behavior blockers and integrity checkers. It supports all of the most popular operating systems, e-mail gateways and firewalls. KAV controls all possible virus entry points. Kaspersky Lab's powerful and flexible local and network management tools for auto-mation and centralized installation and control over anti-virus protection provide maximum convenience and minimum time wasted when building your own structure of an anti-virus defense. Kaspersky® Anti-Virus 6.0 combines reactive antivirus detection methods with the latest proactive technologies to provide your computer with the most effective protection against malicious programs. The product is simple to install and set up, while offering advanced users a range of versatile settings for fine-tuning the program. Kaspersky Anti-Virus 6.0 integrates seamlessly with the Microsoft Windows family of operating systems (including Microsoft Windows x64) and is fully compatible with other security programs (for example, firewalls). * Combined antivirus technologies. Kaspersky Anti-Virus 6.0 relies upon integrated methods to scan for viruses: the reactive method (using signature databases) and proactive protection (behavior blocker and heuristic analysis). * Optimized for use on laptops. Users of laptops benefit from an economy mode that conserves battery energy, while users of WiFi (wireless)Internet services can automatically update antivirus databases. The program has been optimized for use on laptops based on Intel Centrino mobile technology, and for use on computers with Intel processors that support Hyper-Threading technology. * Simplicity and convenience. Kaspersky Anti-Virus 6.0 is installed and set up in a matter of minutes, while the context-sensitive help function helps users quickly understand the finer points of the program’s capabilities. Moreover, the program regularly notifies users of its current protection status and gives recommendations for dealing with virus epidemics and potential threats. - Protection for email. Kaspersky Anti-Virus 6.0 scans email traffic for viruses according to the protocol via which it is sent (POP3, IMAP and NNTP for incoming mail and SMTP for outgoing mail) on any mail program, while plug-ins and treatment for viruses in Microsoft Outlook and Microsoft Outlook Express mail databases are offered. - Scanning of Internet traffic. All HTTP Internet traffic is scanned for viruses in real-time, ensuring that infected objects are not saved to the computer’s hard disk. - Protection for file systems. Individual files, catalogues and disks can be designated for antivirus scanning. Users can limit antivirus scanning to critical areas of the operating system and startup objects to ensure that attention is focused on the most vulnerable areas of the system. - Control over changes in the file system. With Kaspersky Anti-Virus 6.0 it is possible to compile lists of applications, the component structure of which will be controlled, thus helping to prevent malicious programs from undermining the integrity of the application. - Monitors processes in the memory. The product monitors the activity of programs and processes that have been launched in the computer’s memory and, at the same time, warns users of any dangerous, suspicious or hidden processes (that is, rootkits), and of unauthorized changes in routine processes. - Monitors changes in the operating system registry. The application controls the status of the system registry and notifies users of any suspicious objects or attempts to create hidden keys in the registry. - Blocks dangerous macros. Proactive protection affords control over the operation of macros based on Visual Basic for Applications in Microsoft Office documents and blocks dangerous macro-commands from being executed. - System restore. The system can be restored after malicious activity. Kaspersky Anti-Virus 6.0 can roll back any changes made to the system by malicious programs. - Technology for accelerated antivirus scanning. iSwift and iChecker technology make it possible to limit scanning to new and modified files, or to limit scanning to potentially dangerous objects only. Antivirus scanning can be suspended during times of increased user activity to ensure that your computer’s resources are free for your use. - Reduced update sizes. The size of updates downloaded to users’ PC has been reduced almost 10 times (now amounting to several tens of kilobytes) in Kaspersky Anti-Virus 6.0, making our updates virtually instant. Today, threats to PCs are appearing in ever-greater numbers and diversity. Cyber criminals on the Internet are well organized and tend to target PCs with combined threats. A standalone antivirus solution is no longer enough to fully protect your PC. Kaspersky Internet Security combines reactive detection methods with the latest proactive technologies, protecting your PC from viruses, hacker attacks, spam and spyware. Seamless integration of all product components eliminates system conflicts and provides fast performance. * Email protection. The program scans email traffic for viruses according to the protocol via which it is sent (POP3, IMAP and NNTP for incoming mail and SMTP for outgoing mail) on any mail program. We also offer plug-ins and treatment for viruses in Microsoft Outlook and Microsoft Outlook Express mail databases. * Scanning of Internet traffic. All HTTP Internet traffic is scanned for viruses in real-time, ensuring that infected objects are not saved to the computer’s hard disk. Statistics about harmful scripts can be accessed using a plug-in for Microsoft Internet Explorer. * File system protection. Individual files, catalogues and disks can be designated for antivirus scanning. Users can limit antivirus scanning to critical areas of the operating system and startup objects to ensure that attention is focused on the most vulnerable areas of the system. * Proactive protection. Kaspersky Internet Security monitors program activity and all processes launched in RAM. It notifies users of dangerous, suspicious or hidden processes (that is, rootkits), prevents harmful changes to the file system and restores the system after malicious activity. * Secures confidential information. The program prevents confidential information (such as passwords, bank account numbers and credit card details) being stolen from your computer. It detects phishing messages and disables links to phishing sites. * Safe Internet surfing. The program prevents dangerous scripts from being launched on websites, and blocks popup windows and advertising banners. * Blocks automatic dial up programs. Any unauthorized attempts to dial up premium-rate telephone services from your modem are blocked. * Blocks network attacks. Intrusion detection system monitors any network activity that has the characteristics of a hacker attack. The program prevents hacker attacks by blocking connections from the hacker’s computer. * Full control over network activity. The program controls all requests from applications to websites, in accordance with the program rules that have been set, and tracks all incoming and outgoing data packages. * Safety on all networks. When a computer connects to a network, the program asks you to specify the type of network (a trusted network, Intranet or the Internet), so that the firewall can choose how strict the rules should be. * Stealth mode. This technology makes the computer invisible to outside users, effectively preventing all types of DoS (Denial of Service) attacks. * Integrated protection from spam. Several methods are used in combination to ensure the highest possible level of spam detection, including blacklists and whitelists of IP addresses and word combinations typical of spam together with self-learning algorithms. The program also scans graphic images for spam attributes. * Support for common mail programs. An expansion module, specifically designed for Microsoft Outlook and Microsoft Outlook Express, enables you to set processing rules for messages according to their post-analysis status. * Preliminary analysis of messages. To economize time and network traffic, the Mail Manager conducts preliminary analyses of message headings in all incoming email before downloading them from the mail server. This also reduces the risk of spam and viruses being downloaded to your computer. Droppix Recorder - The ideal solution for all your CD and DVD burning projects. Droppix Recorder is a universal software suite that has made a name for itself based on both its powerful features and its ease of use. Droppix Recorder is a complete solution for all your CD and DVD burning needs. Whether you are creating your own music compilations, burning your vacation memories, making a copy of your favorite CD, or simply backing up your important data files to CD or DVD ... Droppix Recorder makes it simple! For more experienced users, Droppix Recorder offers a suite of sophisticated utilities. For example, you can create perfect copies of CDs and DVDs, instantly erase re-writeable discs, test the performance of CD and DVD drives, and automatically update your drive's firmware in order to take advantage of the latest improvements offered by the manufacturers. Discover Droppix Recorder 2.0, the most complete and easiest to use solution for copying, burning and printing your CD, DVD and Blu-Ray discs! - 1, 2, 3 . . . Burn! · Based on a new, more robust software architecture. · Simple and intuitive drag-and-drop user interface. · Includes Droppix Label Maker to burn LightScribe silkscreen-quality disc labels direct from your PC. · Easy creation of greatest hits CDs and advanced multimedia compilations. · Create, convert and display CD and DVD disc images (ISO, CUE/BIN, DWI, etc.). · Support for most common video formats. · Validate all project files and verifying disc recording. · Native support of CD-Text, CDDB and ID3 tags. · Benchmark and analyze CD and DVD drive performance. · Customizable skins including new 3D Glass skin. · Supports most available CD and DVD burners, including DVD-RAM and dual-layer DVD recorders (9 GB). · Supports all plug-and-play recorders (IEEE-1394 and USB 2.0). - The Droppix Recorder main window size may now be greater than 1280x1024. - Fixed a crash when user tried to register a plug-in. - Fixed problem on autodetection of multiple drives when user tried to hot-plug a CD/DVD tower (USB, firewire, etc). - Fixed random Windows Explorer crash. - Various other minor bug fixes and improvements. Graphics Converter Pro is a powerful tool that can convert, process and view image files. It a 32-bit software program that runs on Microsoft Windows 95, 98, NT 4.0, ME, XP, 2000 Operating Systems. Graphics Converter Pro can open images in 500 formats. Image Transformer can save images in the following formats: BMP; GIF; JPG; PNG; EMF; TGA; WMF; TIF or WBMP. Image Transformer has 60 image filters, including Blurring, Sharpening, Embossing, Diffusing, Color Balance and more. Graphics Converter Pro has 13 image effects, including Flip, Wave, Noise, Arbitrary Rotation and more. A smart screen capture tool which can be used to capture images of various sizes from your desktop or any other software. · Can import more than 500 graphic file formats and many sub types. · Can export 140 graphic file formats. · Supports 13 image effects, including Flip, Wave, Noise, Arbitrary Rotation, and more. · Provides a smart image capturing tool to capture images of various sizes from a desktop or any other software. · Can convert a group of image files in 25 formats to BMP, GIF, JPG, PNG, WBMP, EMF, TGA, TIF and WMF files. · Can convert any part of an image to BMP, GIF, JPG, PNG, WBMP, EMF, TGA, TIF and WMF files. · Has a powerful and easy-to-use slide-show tool. · Support file association, live update check. SpyRemover detects and removes more than 59,800 types (more than 144,000 items and variants) of intrusive devices such as spyware, adware, hijackers, keyloggers, Trojans, tracking devices, hacker tools, and other spy devices on your PC. This spyware remover is powerful and easy to use. It works with Windows 95/98/Me/NT/2000/XP. A Perfect Complement to SpyStopper. SpyRemover can remove the most difficult spyware infection for you. It is one of the most popular anti-spyware applications on Internet. More than 2 million copies have been downloaded. New definition database updates released January 27, 2007. - A Powerfull, Simple and Intuitive Editor. Guitar Pro allows you to create whole scores for guitar, bass or other stringed instruments in a few minutes. - View and Listen to your Tablatures. Far more than a simple editor, Guitar Pro allows you to view and listen to a score under the best conditions. - Import, Export and Share! Import and export MIDI and ASCII format, and enjoy the tens of thousands of tablatures available on the Internet in Guitar Pro format. The version DOES NOT include the RSE [Realistic Sound Engine]. QuickTime Alternative will allow you to play QuickTime (.mov .qt) files. This way there is no need to install the offical QuickTime Player. It also supports QuickTime content that is embedded in webpages. The QuickTime plugins include iPIX and QuickTimeVR. 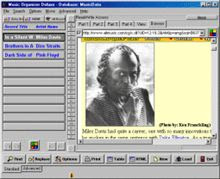 The QuickTime Browser plugin supports Internet Explorer, Opera, Mozilla and Netscape. The QuickTime plugins include iPIX and QuickTimeVR. As a bonus, Internet Explorer will play all QuickTime movies that are embedded in a webpage. You do need a media player that is capable of playing QuickTime files. Media Player Classic [version 6.4.9.0 rev 611]: this is a full-featured player which has internal decoding support for DVD, MPEG-2, MP3, MP2, AAC, AC3 and DTS. It also has internal support for opening Matroska and Ogg containers. Media Player Classic is also capable of playing QuickTime and RealMedia content if those codecs are installed. - QuickTime Codecs [version 7.1.3.100]: required for playing QuickTime content. Trojan Remover will also routinely check for any loading Windows Services which have been hidden from normal scrutiny using Rootkit techniques. Trojan Remover is designed to work on Windows 98/ME/2000/XP. Trojan Remover 6.5.6 will run on Windows Vista, although it does not at present completely conform to Microsoft's recommendations for applications designed to run on Vista. Because of this, Windows Vista will display an Application Compatibility warning when you start the program - the link on that warning message may have led you to this website. - Added detection for stealthed "Taskdir" entries. - Added rootkit-scanning of entries in the Winlogon registry key. - Modified configuration utilities; different users on the same PC can now have different configurations. AB Commander™ is the next generation dual-panel file manager and Explorer replacement, that enables you to work with your files and folders quickly and efficiently. In addition to the regular file management operations, it includes built-in file splitter, folder synchronizer, image viewer with the slideshow capabilities, full-featured text editor and more. - AB Commander puts you in control of your files and folders. - AB Commander is suitable for a wide range of file management tasks. - AB Commander works with drives of any format. - AB Commander runs on a wide range of Windows platforms. From Windows 98 to Windows 2000 to Windows XP and later, with all service packs and hotfixes, all are supported by at least one of the available editions of AB Commander. - AB Commander is easy to use. - AB Commander "speaks" plain English. - AB Commander is widely used. - AB Commander is flexible. - AB Commander can be used with other disk and shell tools. - AB Commander is actively maintained. Since its first release back in 1998, we've been continuously extending, enhancing, and improving AB Commander. Now in version 6.9, AB Commander gives you more power than ever. - Compatibility with Windows Vista has been implemented. - A new option to add the keyboard shortcuts to the History and Favorites menus has been added. - Some visual options (animated icon, popup indicators) have been eliminated. (Windows XP and Vista provide enough visual options to allow us retire ours). - The Allow quick rename option, if cleared, no longer blocks the rename commands initiated via the F2 key or context menu. - Several other minor improvements and corrections have been made. - Uninstall programs that can't be uninstalled through Add/Remove Program. - Advanced Uninstall to solve "prevent-reinstall" problems. - Cache support for fast access to all programs. - Know more about each program installed on your computer. - Quick access to various install locations. - Deep system scan after uninstallation to find hidden registry entries. - Customized color for each type of programs. - Load undocumented startup programs in Startup Manager, it's easy to find some spywares. - Newly added Start Menu Manager keeps Start Menu always clean. - Improved Disk Cleaner provides more options and faster speed. - Wizard style uninstallation process keeps Your Uninstaller! 2006 easy to use. - More options added for advanced users. - Other many minor improvements and changes. * Free 100% Real-Time Protection is included in Spyware Terminator basic version – an essential function most other applications charge you extra for. Effectively remove spyware, adware, trojans, keyloggers, home page hijackers and other malware threats. Interactive, vector-based animations is a snap. Produce complex animated graphics with images, shapes and text using more than 130 built-in animation effects like Fade, Zoom, Rotate, Fly and more. Flash Designer exports SWF files in Macromedia Flash™ format, and HTML code necessary to integrate the animation with your Web page. It also offers basic editing tools to modify any image, resize it, add objects etc. IconCool Studio with Vista Icon Editor - Professional Icon Editor & Icon Maker. IconCool Studio is a complete solution for 32 bit icon and Vista icon editing, modifying and creating. In addition to icon and cursor formats, it also supports editing of GIF, JPG and PNG image files. The program includes standard image editing tools, as well as a variety of filters and effects. Other features included support for PSD plug-ins, Animation GIF Builder, integrated icon search feature and more. - IconCool Studio 3.0 has begun to support the next generation OS Window Vista from now on. You can create and edit Vista icons which includes the compressed 256x256 images easily. - There are some Vista sample icons in IconCool Studio package, and after registration you can get more Vista style icons created by our icon design team with IconCool Studio. - IconCool Studio supports for PSD Plug-in, it allows you to transfer an image to IconCool Studio from Adobe Photoshop application and it also can send an image to Adobe Photoshop. IconCool Studio can load and export PSD (supports the transparence) , PNG, GIF, ANI file and so on. - IconCool Studio can customize the Windows icons. - IconCool Studio has an easy-to-use GIF frame builder, you can easily create or edit animation GIF files. - IconCool Studio supports 50 image filters, including Blurring, Sharpening, Embossing... as well as 15 image effects, including Linear Gradient, Wave, 3D shadow, 3D Button, Text Gradient Effects, and so on. - IconCool Studio lets you can set the coordinates and radial angle. - IconCool Studio has a powerful search function, it can search icons and all supported image files from computers and network. - IconCool Studio can edit multi-format icons at one time. - IconCool Studio can import images in the following formats: BMP, DIB, EMF, GIF, ICB, ICO, ICL, JPG, JPEG, PBM, PCD, PCX, PGM, PNG, PPM, PSD, PSP, RLE, SGI, TGA, TIF, TIFF, VDA, VST, WBMP and WMF. - IconCool Studio can save icons or images in the following formats: BMP, CUR, GIF, JPG, ICL, ICO, PNG, WBMP, EMF, WMF, TGA and TIF. - IconCool Studio uses various image filters (Blurring, Sharpening, Embossing, and so on)and image effects. - IconCool Studio improves the arithmetic of basic drawing tools(such as dot, line etc.). · Pause and resume broken downloads, recover from a dropped Internet connection. · Easy integration into Internet Explorer, Netscape Communicator, Opera, and Mozilla in any Windows operating system (95, 98, Me, NT, 2000, and XP). Simply grabs any URL from these popular browsers and Fresh Download will take over. · Clipboard monitoring and drag & drop features. Easily grabs any URL from any applications! · Antivirus support. Scan downloaded files from any viruses using your current antivirus software! · Plus now it has a built-in Zip file extractor! What's new: traffic bar under the toolbar. Nero 7 Premium supports Blu-ray technology and gives you the ability to burn your data to BD-RE and BD-R (Blu-ray) media, which enables you to store enormous amounts of data (25-50 GB) onto a single disc. Now take Nero technology with you anywhere you go! With Nero Mobile, your mobile phone, PDA, PMP, and other portable digital media devices let you show photos, listen to music, and watch videos at work, at the gym, on the train, in your car…anywhere. Make unlimited free PC to PC calls via the Internet with Sipps! Reduce your home and business phone bills with one simple solution. VoIP is the new era of phone communication for PC to PC as well as landline and cellular phones. Along with Nero’s award-winning CD and DVD burning capabilities in Nero 7 Premium Reloaded, you can now enjoy the benefits of Blu-ray and HD DVD disc data recording technology, which are fast becoming the industry standard in high density digital media compression and recording. Convert your files to your preferred format and store up to 58 normal-sized CDs on one high density disc with any of Nero’s five burning and back-up applications. Convert your entire music collection to MP3 or mp3PRO! Now you can change unlimited amounts of digital songs into MP3 and mp3PRO format to enjoy at home, at the beach, during a study break, and everywhere you go. Not sure if you’ll be in the mood for Mozart or Metallica? Pack every option onto your digital media player with unlimited MP3 and mp3PRO support from Nero 7 Premium Reloaded. With Nero Home, you can easily access, watch, and burn all of your digital media files from the comfort of your living room using a remote control. Enjoy streaming TV, TV time-shifting, TV recording, DVD, video, photo, and audio playback support. Now Nero Home offers TV Picture in Picture (PiP) full-screen display for simultaneous recording and viewing! Nero Vision lets you be your own video and audio editor! Insert smooth transitions in your music and video files. Clean up background noise or use the simple image-editing utility to retouch photos with an array of filters and effects. Create professional DVDs for friends and family by customizing 2D and animated 3D menu templates. - IE Manager updated to v1.3. - adds the fix function that IE can not save form username and password. - to recover files from devices with unknown file systems including HD, CD, DVD, floppy disk, Compact Flash Card, USB drive, ZIP drive, Memory Sticks and other removable media. * New file systems support. In addition to FAT/NTFS/ExtFS2/ExtFS3, R-Studio 3.0 supports UFS1 and UFS2 file systems that are used in FreeBSD, OpenBSD, and NetBSD operating systems. R-Studio Emergency version*. R-Studio Emergency version was developed and added to R-Studio packages at no extra cost. R-Studio Emergency version is run from a compact disk or floppy disks set when it is necessary to recover data on a computer, on which Windows cannot start up because its system files are corrupted or deleted. * R-Studio Emergency version is a part of R-Studio software package. When you buy R-Studio single license you may run R-Studio Emergency or/and install R-Studio version on one and the same PC only and you may not transfer the licensed software to another. - MS Office files (Word documents and Excel spreadsheets only). * Scan process visualization. While scanning an object R-Studio graphically shows items that have been found, including files of known types, FAT and NTFS MFT records, boot records, etc. * On-the-fly registration*. R-Studio and R-Studio Emergency Demo versions can be registered on-the-fly and R-Studio user does not need to reinstall a retail version when his files have been already found. * Enhanced remote host scanning procedure. In the new R-Studio network versions, data are analyzed on the remote host rather than on the local host and thereby a speed of recovery procedure greatly increases. CloneCD is the ideal tool to make backup copies of your music or data CDs, regardless if they are copy protected or not! CloneCD's award-winning user interface copies almost any CD in just a few mouse clicks! CloneCD allows you to create excellent 1:1 copies of your valuable original discs. E.g., should your copy protected music cd not play in your car audio, the backup created with CloneCD will! Since release 5.0 CloneCD is able to copy not only CDs but as well all formats of DVD like DVD-R, DVD-RW, DVD+R, DVD+RW, DVD+R Dual Layer und DVD-RAM. Copy protected movie DVDs can only be copied with AnyDVD. The movies will not be modified (compressed), but one-to-one copied. - Intuitive user interface, easy to use for novices! * The logic of click monitoring for IE-based browsers (MSN Explorer, Avant, MyIE, some versions of AOL etc.) was moved from idman process to a separate exe module. This module can be turned on/off in "Options->General"
Music Organizer Deluxe is a Windows software that allows music collectors, audiophiles, hobbyists, dealers, and clubs to organize, catalog, and manage their collections on their PCs. you easily and quickly organize your music information. * Quickly access your data: You can access and view your data in virtually any way. Table Viewer allows you to view data in rows and columns. Browser Viewer allows you to view data in virtually any way using browser viewer. Standard Record Viewers allows you to easily enter, and modify records, or quickly generate data specific commands. create quality, professionally looking documents, reports and summaries, Web pages and catalogs, labels with color and graphics. * Flexible productivity tool: Using a helper program called Designer you can easily modify templates included in the package. * Learn once use multiple times: You can use application for all your database needs. * Web ready: Web Ready features give you the ability to publish your database to the Web. You can easily launch E-mail program or Web browser. data from freedb.org site directly into our program. You can import the following information: CD title, artist name, category, and tracks.